CHANGE: Better Management of Online Services. CHANGE: Improved quality for rendering of OSM, BING, WMS and ESRI overlays. CHANGE: Offline Maps – possibility to zoom to map extent and set transparency. CHANGE: Offline Maps – multiple mbtiles can now be displayed on the map. CHANGE: WMS – possibility to set transparency for each service. CHANGE: Support for Dropbox SDK version 2 – please update to this version if you experience problem with Dropbox connections. CHANGE: Application permissions – now only Location and Access to the SD Card to support local export is required. FIX: On some devices there was a problem with Dropbox link from Import/Export tab. Now fixed. FIX: On some devices there was a problem with importing from files. ADD: Share exported files as export type. Minor bug fix connected to ‘Tap on the map’ method of adding points to measurements. Minor bug fix for users with android 4.0.3 – some users had problems with accessing the app. ADD: Option to Insert vertex – press the blue marker to insert new vertex between two existing vertexes. FIX: Data Import KML -> When coordinates in KML file where not having the HIGHT information provided there was a problem with import. FIX: Problem with address/place search has been fixed now – it was caused by the 3rd party URL change. – Added “Geoid Height Extension” (To enable go to Measurement’s settings) – allows to record height above EGM96 geoid which approximates mean sea level. – Bug Fix – record track button was visible when app was started. – Possibility to set Line, Ruler or Polygon Outline Size in Measurement’s Settings. – Bug Fix – on some devices app was crashing when the GPS position was unknown. – Improved Marker bitmap generation method – much faster now when large number of points is displayed on the map. – Replaced color picker for point’s categories – support for transparency. – Possibility to change point marker size in General Settings. Important emergency update – bug fix, after last update the app was not starting if someone has option “Remember map type” ticked in general settings. Now fixed. We are sorry for any inconvenience caused. Added support for SIRGAS 2000 (South & Latin America) UTM coordinate system. Resolved some problems related to Bing Maps on high density devices. 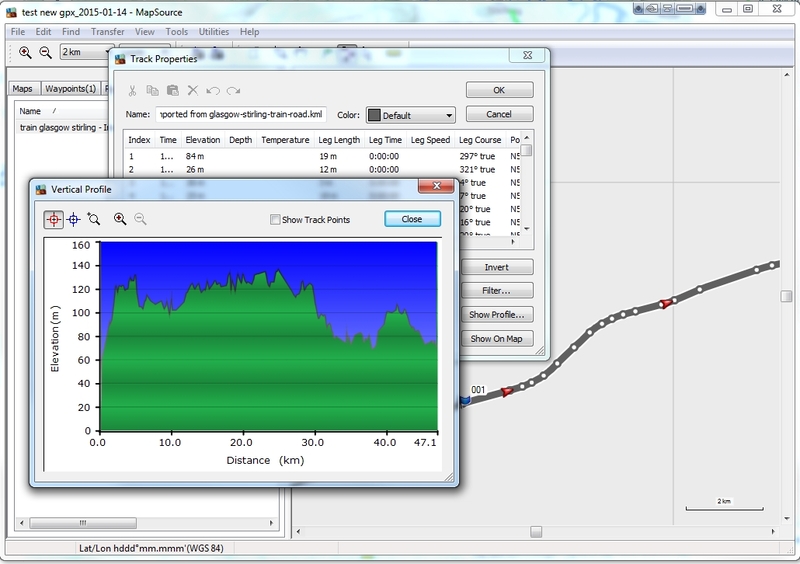 GPX Export is now compatible with Garmin MapSource software. Added End User License Agreement information. Added Spain Orthophoto Map to set of default WMS overlays for Google Maps. Warnings added to Project Management before the values and attributes are removed. – Complete layout upgrade to support Android 5.0 (Lollipop) materials design. – “Quick action” menu for list elements has been replaced with an Action Mode. – Map selector and WMS overlays are now placed in navigation Drawer. 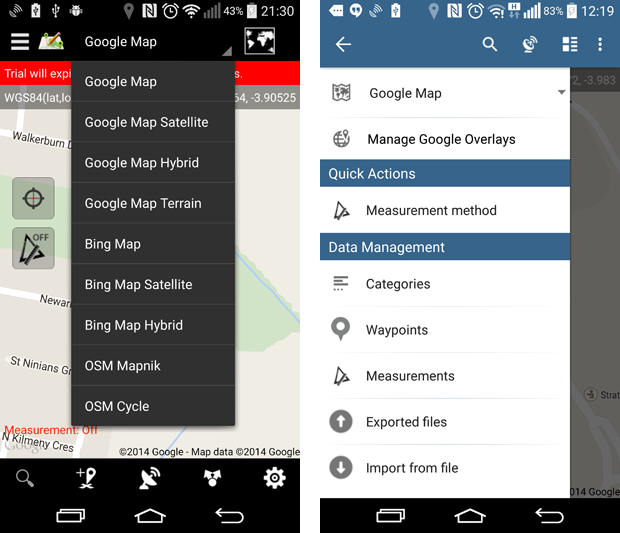 Basemap dropdownlist and services overlays location before and now. Quick Action menu has been replaced with Action Mode at the top of the screen. – Improved performance and markers drawing speed on the map when working with large number of point data. – Fixed some minor bugs related to names in header for CSV export. – Added new WMS service “Cartografia catastral” for Spain to the list of default WMS services. – BugFix: When single waypoint location was shared coordinates were in wrong order longitude was coming as first, now fixed. – Added option to share single location directly from waypoint’s options screen. – BugFix: Problem with coordinates – decimal minutes were not properly displayed. – Bug fix: some KML files could not be loaded properly onto the map screen after the import) – OSM and Bing Maps. – Intermediate distances are now switched-off as default. Please go to measurement settings to enable this feature. – Bug fix: sometimes the map was centered on the last saved position when switching between the Google basemaps even if ‘Center on GPS’ was off. – Bug fix ( some KML files could not be loaded properly onto the map screen after the import). 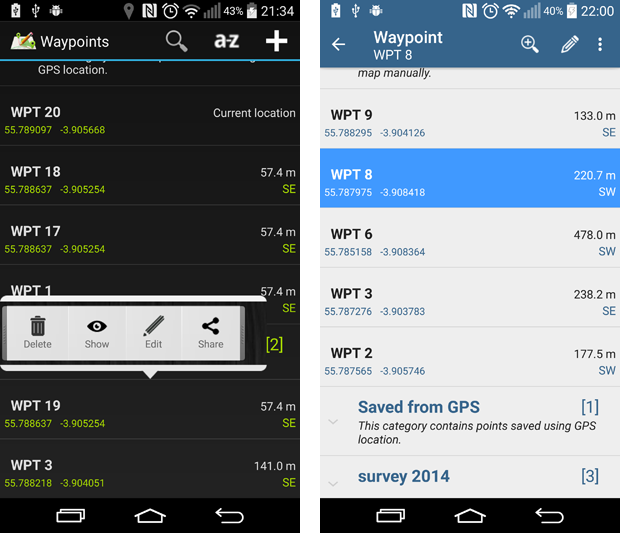 – Added possibility to export waypoint’s categories to OV2 (TomTom POI) format. – Some issues with ‘Project Management’ (in-app payments) should now be fixed. – On some devices there was a problem with displaying bearing and perimeter information when measurement was started in OpenStreetMap Mode – now fixed. – Some bug fixes related to ‘Project Management’ ->’Add Point’ action. The map was wrongly zoomed-in to the previously added point. – Some minor design improvements. – Some bug fixes related to ‘Manage Categories’ screen. – Fixed issue with ‘Edit Waypoint’ screen – on some devices there was a problem with changing point category. – Possibility to attach pictures to the registered waypoints. Pictures taken and linked to the points are stored into: SD Card\MapPad\Pictures folder and the location details are displayed on the “Waypoint options” screen. – Waypoints options screen redesigned. – Few changes to the ‘Map’ and ‘Settings’ layout. – Added possibility to display speed and altitude when “Follow GPS” is enabled. This option can be enabled in ‘General Settings’. Show speed & altitude option. – Exported files screen re-designed to include files exported to dropbox. – When exporting to CSV local coordinate system is maintained e.g. if your default spatial reference is British National Grid exported coordinates will be easting, northing of British National Grid. – SAD69 Datum is now supported for Brazil (http://www.ufrgs.br/engcart/Teste/refer_exp.html) – 3 parameters Molodensky transformation applied to transform coordinates between WGS84 and SAD69. Coordinates displayed in MapPad are UTM SAD69 easting and northing. – Google Maps Basemaps can now be rotated – this option can be enabled in General Settings (use 2 fingers to rotate the map). – Export Multiple – now you can export multiple measurements line or polygons to one KML, GPX, DXF or CSV file. – Open Street Map access has been fixed. There were some problems with OSM basemap caused by new data access policy introduced by OSM in January 2014. Fixed issues with dragging/moving measurement points. – Added support for UTM (NAD83) and UTM (MGRS – NATO) coordinate systems. – Improved behaviour for move points(vertices). Click on the vertex to enable the move mode then long press to start the drag operation. – Export measurements to DXF. – Added option to see and share DXF files under Data management>Exported Files. – Possibility to move\drag measurement vertices and waypoints when using Google Maps basemaps (long press the marker to start the drag operation). – Edit WMS – possibility to change visible layers without adding the service again. – Added option to share WMS url. – Bug fix: during remove last point operation not all markers were cleared from the map. – Improved support for WMS, now services with WGS84(CRS:84, EPSG:4326) spatial reference should be displayed properly over the Google Maps. – Option to share single waypoint to the number of services and standard ways like SMS or E-mail. – Transparency of Google Maps overlays WMS and ArcGIS Server Tiled services can be now changed. Now you can add WMS (at the moment only predefined one) or ArcGIS Server Tiled map service as Google Map overlay. Pre-configured Arc GIS Server Tiled services. – Dropbox implementation (article will be posted soon explaining details). You can now import kml or gpx files or export waypoints’ categories or measurements directly from or to your Dropbox account. To activate and link your MapPad Pro with Dropbox go to ‘Import Data’ and choose ‘Dropbox’ tab. Press the button to connect to Dropbox. During the Authorisation process new folder called MapPadPro will be created in your Dropbox>Apps. You can put files into that folder manually using your PC or mobile Dropbox App or push new files using Export measurement or Export Category option. If you want to access the same data from more than 1 device – please use the same Dropbox account on both devices. – Changed application background and fixed few design issues. – Redesigned ‘Settings’ headers – now Google, Dropbox and Bing Settings are merged into 1 category “Cloud Accounts”. – Added option to Settings>Data Management allowing to choose if points from categories created automatically by import operation are initially hidden or visible. – Removed few minor bugs. – Implemented ruler when drawing line features in “Map Cursor” mode. The pink line is being shown from the last added point to the current cursor position allowing to see the total distance and bearing to the next potential vertex. The ruler can be switch on or off in the measurements settings. – Degrees with decimal minutes coordinates format is now supported for WGS84. – Pressing ‘Back Key’ when in settings no longer closes the whole settings activity. – Few minor bug fixes. – Implemented Navigation Drawer for main activity (press menu button, slide the screen from left to right or press drawer button in top left corner of the application to access the drawer). – Function ‘Change measurement method’ now available from navigation drawer. – Easy access to ‘Data Management’ tools from Navigation drawer. – Possibility to change time interval when tracking down to 1s and distance interval to 1m. – Fixed issue with the Force English and landscape mode. – Project new point based on bearing and distance from currently selected location. – Improved Italian translation – thanks to Nicolò Martini. – Removed some spelling errors in English. – Removed bug not allowing to export to OSM measurements imported from files. – Simplified What’s New dialog. – Add waypoints to favorites option added to ‘Edit waypoint – options’ screen. – ‘Edit Waypoint’ screen redesigned. – Bug connected to ‘Add Measurement’ point fixed – when trying to add the point with exactly the same location as the previous one the application was crashing when Google Maps base map was selected. – Possibility to add waypoint providing latitude and longitude. – Removed bug (the map was reset to full extent when switching the base maps after sketch upload or search for place). – Removed bug (shutdown when delete last marker pressed too many times). – Google Maps fragment is now the default Map Viewer. 4 new base maps (Standard, Satellite, Hybrid, Terrain) have been added to the map selection drop-down list. – The code has been reviewed and cleaned, few small bugs removed. – Splash screen has been added to fill the black gap during the application start. – Removed transparency for Action Bar as it was causing problems on some devices.